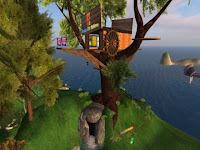 Second Life Children group are pleased to announce SLC Office Hours at the SLC Learning Tree in Whippersnapper. Maybe you have some questions or concerns, you're a newbie looking for help. you want to hang out and meet other kids, you're looking for a little fun and entertainment, or a curious adult wanting to know more about the kid community, then pop along to one of the sessions listed below. Each duty officer may have something lined up for your entertainment, such as a live DJ, a quiz, a theme, stories or a special guest. So come on down and take your face for a joy ride!! Im glad places like this exist in world.. :) and i dont know if the people who devote their time are thanked enough so im thanking them here.. for all their ideas hard work and time they have put into the kid community.